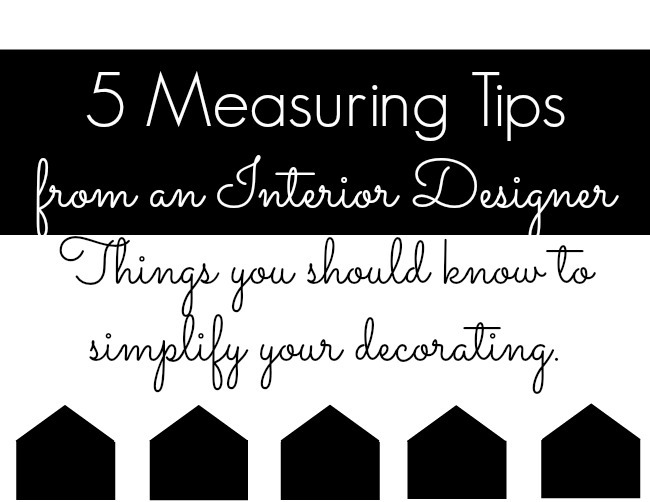 With Pinterest & DIY projects everywhere these days, I thought I'd share some measuring tips to help your decorating go smoothly. These are go-to measurements that never fail, no matter what style you're going for. First, when hanging a light fixture over a table, keep your fixture between 1/2 and 2/3 the size of the table. You should also give yourself at least 36" between the top of the table and the fixture. Higher ceilings? For every 1' higher your ceiling is, you can drop the fixture 5". For a chandelier or pendant in an entry way or corridor, use this formula to determine the size and height. width (in feet) + length ( in feet) = light fixture width (in inches). So if your room is 9'W x 12'L x 12'H, your fixture should be 21" wide. Now take the room height, 12' x 2.5 = 30 x 3 = 90 inches off the floor to the bottom of the fixture. 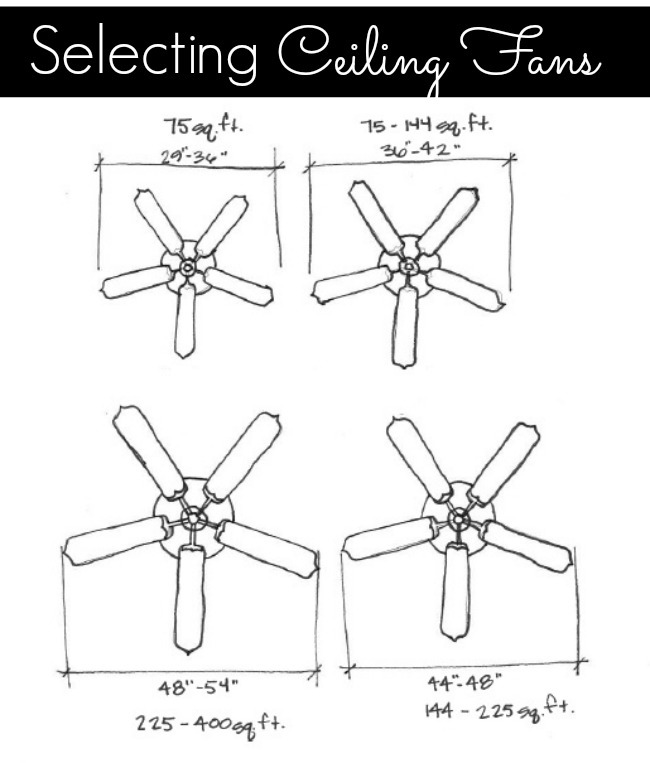 When it comes to ceiling fans, your choice should be on square footage of the room it's going in. If your room has more than 400 square feet, you should consider getting two fans. If the room is rectangular, you might consider getting two smaller fans if the square footage is more than 350. For curtains, make sure your fabric is 3 times the width of your window. That way, even when the curtains are closed, you will have a nice fullness to the drape. When mounting your curtain rod, fix your bracket 4" higher than the top of the window trim and at least 4" to the side of the window trim. 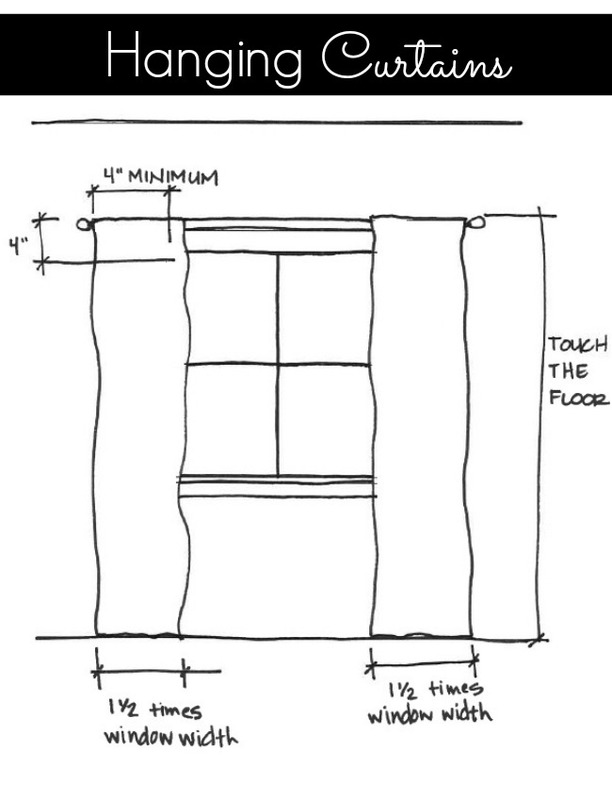 If you want the curtains to be able to open wider, increase the rod length to up to 8" on each side. 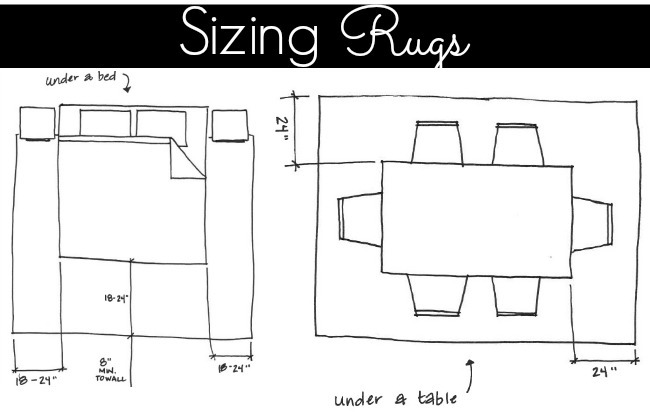 Rugs should nearly always be larger than you think. When selecting a rug to go under a bed, the rug should extend from the sides and foot of the bed 18-24". If you're going to but a bench or ottoman at the foot of your bed, the rug should extend past that 18-24" as well. Also, you should have a minimum of 8" of bare floor from the edge of the rug to the wall. If you don't, you might reconsider using runners instead of a rug. When selecting a rug for under a table, make sure you have 24" from the edge of the table to the edge of the wall. This way, you'll have room to move your chair back without having half of the legs on the rug and half off. The question I get asked the most often refers to proper art height. The center of your piece should hang about eye level, which is between 56-60". If you have multiple frames at multiple sizes, cluster them together and determine the middle. That spot should be hung at 56". 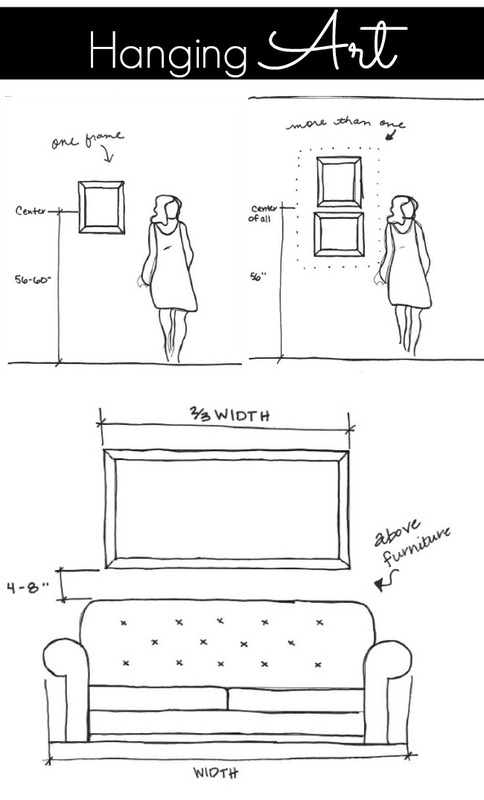 Always leave 4-8" above a sofa and, like the table chandelier, keep the piece 2/3 the width of the furniture. This was a great article with easily understandable graphics! Thank you for putting this together.